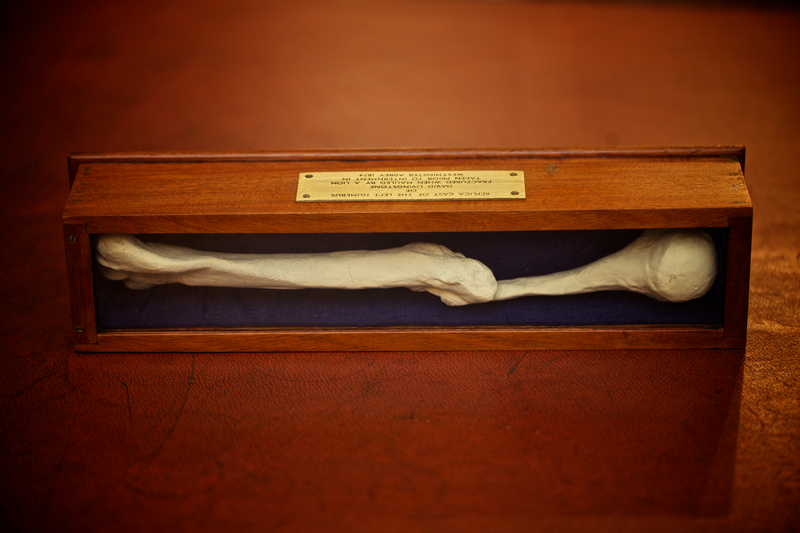 A replica cast of David Livingstone's left humerus, showing a compound fracture which occurred when he was mauled by a lion on his first expedition. The cast being made prior to his internment in Westminster Abbey, the old healed fracture proved that the remains were indeed those of David Livingstone. It was presented to the Royal College by the Livingstone Memorial Trust in 1973 on the anniversary of his death, and is contained within a modern glazed case. 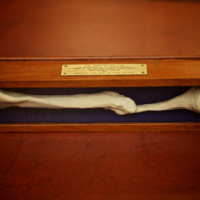 “Dr David Livingstone Humerus Cast,” Heritage, accessed April 20, 2019, https://heritage.rcpsg.ac.uk/items/show/111. Description: A replica cast of David Livingstone's left humerus, showing a compound fracture which occurred when he was mauled by a lion on his first expedition. The cast being made prior to his internment in Westminster Abbey, the old healed fracture proved that the remains were indeed those of David Livingstone. It was presented to the Royal College by the Livingstone Memorial Trust in 1973 on the anniversary of his death, and is contained within a modern glazed case.